Express your heartfelt sympathy with a graceful arrangement of peaceful lavender and white blooms such as roses, stock, alstroemeria and more. Designed by hand in a lovely basket, it's a beautiful tribute to a life well lived. 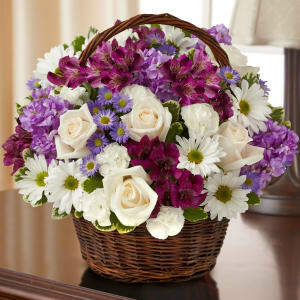 • Graceful lavender and white arrangement of roses, stock, alstroemeria, daisy poms, mini carnations and monte casino, accented with variegated pittosporum and myrtle.